Julie of The Intrepid Thread shop asked me to design a quilt for her shop's monthly tutorial! Lately I've been on a real design kick; my notebook is often out and being doodled in. So, I had a bunch of designs swirling in my head for a new modern quilt. Julie gave me a choice of fabric lines to use from Spring Market and I was drawn inexplicably to Indelible by Katarina Roccella. You might be wondering why I didn't choose the purple colorway since purple is my favorite color e.v.e.r. - it's because at the time, Julie didn't have any left! She does now, though, and I'm sure to pick some up soon! Indelible inspired me to sketch a quilt that features large scale fabrics but also includes some piecing (more than simple patchwork). I was directly inspired by the print "Stylus Text." The quilt is 48" x 62" - a crib quilt or a smallish lap quilt size. You could make it smaller or larger, though, to fit your needs! The top calls for 14 fat quarters and yes, you WILL use almost every scrap. Those that I didn't use for the front I pieced into the back. As I mentioned on Instagram, I found that Indian Summer by Sarah Watson played so nicely with Indelible - gorgeous! The quilting was fun - instead of my customary quilting curves when there's lots of straight lines, I echoed the arrows with my walking foot and improv-ed zigzags in the non-arrow sections (I did a little bit of marking to make them approximately centered). But... I couldn't help swirling the bottom and top of the quilt, in the scrappy strippy parts! This quilt was asking for a nice frame, so I bound it in some purpley/brown Lizzy House jewels. It's like they were waiting around in my stash for this quilt! I leveled this quilt at "Confident Beginner" because you have to be consistent with the cutting and trimming to make the arrows line up right. I explain this fully with pictures in the tutorial. You can download the free tutorial here! Please note my explanations about contrast when you are choosing fabrics. Thanks again, Julie, for letting me design and quilt for your shop - I had a blast! Oooh it turned out great! You might have to make a second one in the purple colorway, because I think it would be amazing! ah man now I totally want to make one. This is so lovely! 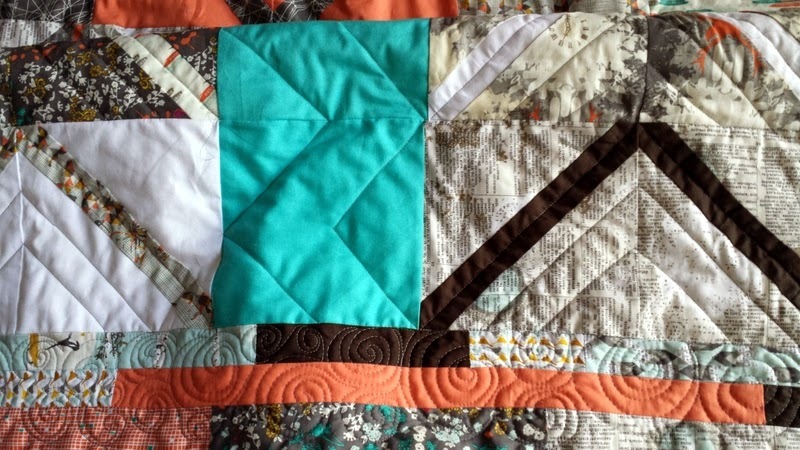 The understated zigzag quilting really sets off the design :) Great job Jess! So beautiful! The arrows quilted into it look great too. How fun to design and play with fabrics! Well done Jess! Very nice quilt! I like how you can mix and match fabrics.